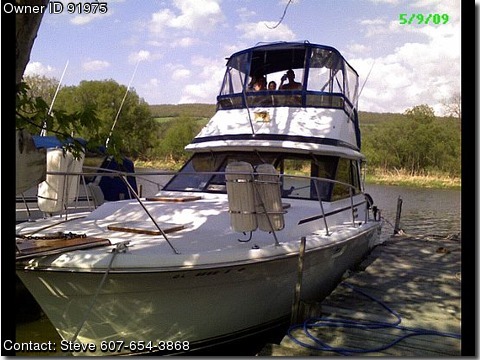 Call Boat Owner Steve 607-654-3868. Motivated seller needs to sell this beautiful Medallion Edition Trojan F-32 Flybridge because my daughter will be going to college in the fall.. Currently owned by a Coast Guard licensed Captain for pleasure only. Over 10 years of maintenance records and all the manufacturers books on the boat. This boat has Twin inboard Chrysler 318's with low hours. Complete access to engines through salon floor. Walk in salon with full sliding glass doors, newer carpeting, couch that pulls out into a full size bed. Plenty of head room in cabin space. Sunken galley with stove, microwave, refrigerator and storage cabinets. Dinette drops down to sleep two with storage drawers underneath. Head with shower and high pressure shower head. 40 Gallon fresh water and 40 gallon holding tank with holding tank alarm in head. Forward V-berth with port and starboard storage lockers and 4 storage drawers. Cockpit has compressed air system for inflatables and air horns, a raw water washdown for cleaning, barbeque with mount, built in tables with cup holders and two new marine deck chairs. Upper and lower helm stations. Upper helm station on flybridge has depth finder/fish finder, engine sync, GPS, Autopilot, additional depth sounder, electric and air horns, VHF radio, Compass, two captains chairs and bench seating in front of helm. Flybridge is fully enclosed with newer canvas. Lower helm station is located in the salon and has engine sync, depth finder, autopilot, VHF radio, compass. AM/FM CD player with USB and AUX connections. 2000 Watt amplifier, two outdoor speakers in cabin and two outdoor speakers in cockpit. Two 30 AMP Shore power connections with split/crossover switch in electric panel. 12v and 110v lighting, TV cable wiring installed in cabin and to flybridge. Portable vented AC unit comes with the boat..
Electric heaters in galley and v-berth. Window locks on all windows, deadbolt on sliding glass doors, this boat stays secure. Bow has a Teak Bowpulpit and fender holders installed. All lifejackets, flares, fenders and lines go with the boat.